Malaika, living in a Caribbean country with her grandmother, waits not so patiently for her mother to send money home from Canada. The money is to be put towards Malaika’s Carnival costume, but when a letter from mom arrives sans money, the little girl is devastated. Grandmother offers a hand-me-down costume, but Malaika was counting on something that would be just hers. She runs from the house into the town, and then hears a song on the radio: “My grandmother tell me,” the song says, “we are poor, but we have dignity.” Malaika visits the local tailor, Ms. Chin, who provides her with a bag of scrap fabric and returns home; her grandmother has cleaned up the old costume, and the two work together to give it new life, using the scraps from Ms. Chin. When they’re finished, the result exceeds even Malaika’s high expectations: She had dreamed of a beautiful peacock costume, but never one as beautiful as this. In our experience, books that aim to share a foreign culture tend to be either watered down dreck or so focused on education that they forget entirely to be entertaining. It’s a very difficult tightrope to walk. 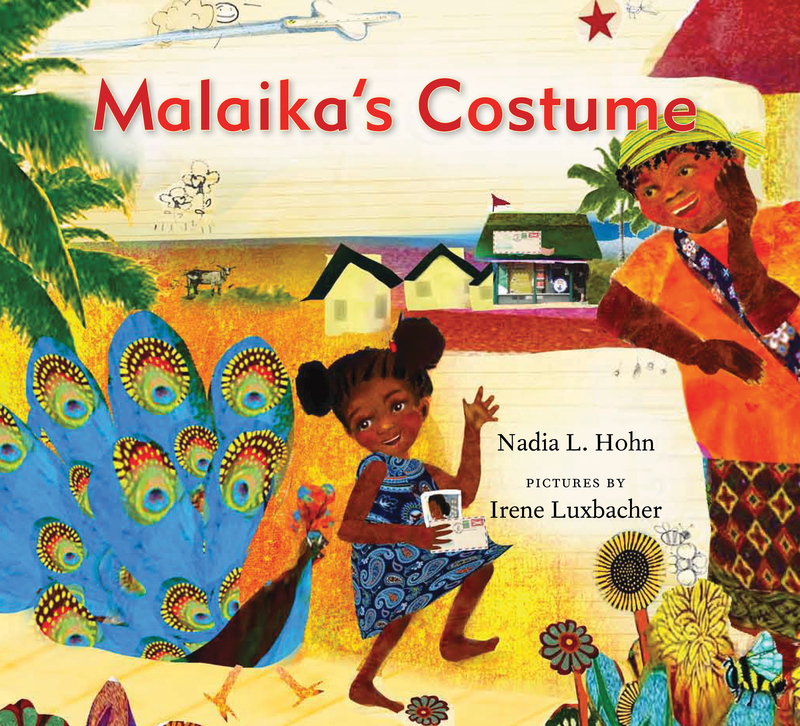 But walk it Nadia L. Hohn does, with her picture book debut, Malaika’s Costume. Based in Toronto, Canada, she tells an engaging, poignant story with exquisite taste and wonderful details. Narrated in a Caribbean patois, it feels simultaneously like a modern parable and a classic folktale, and manages to provide a mountain of fun educational points –including a brilliant passage that subtly describes the many different types of people one might typically find in the neighbourhood– without feeling like it’s dumping information on the reader. Hohn never forgets that she’s telling a story, first and foremost, and keeps things moving briskly, sneaking in knowledge deftly, like you might hide vegetables in your kids food. When they finish the book they magically know things! Where also we live in Toronto –smack dab in between a very well-off enclave, and a bustling but less polished Little Jamaica– it’s not unusual for us to see families split between two countries, where one parent has come here to work and provide for those back home. It’s not a situation I can ever remember seeing portrayed in a picture book before, and it’s masterfully done here. We want our kids to know that other people might live differently than we do, and Hohn has shown a way of living that might be difficult for some (kids and parents alike) to understand, and she does so in a way that sheds tremendous light on the whys and hows. Malaika’s Costume shows us what’s really important, subtly teaching lessons on gratitude, family and creativity. Illustrator Irene Luxbacher’s collage work evokes the feel of traditional Caribbean folk art, but feels contemporary at the same time. It’s beautiful and is unique in the current children’s book landscape. Highly, highly recommended, and essential if one of your parenting goals is opening your child’s eyes to the way others live.